I love e-books. I really love free e-books. And when you combine a free e-book about fashion, it’s a win-win situation for me! Blogger extraordinaire and style guru (who’s also incredibly brilliant; just read her about page) Heidi Nazarudin has written her second e-book. Her first e-book was titled “Blogger Babes Manual; Intro to Blogging.” You see, she’s also the President of The Blogger Babes. Told you she’s brilliant. Anyway, about that new e-book. 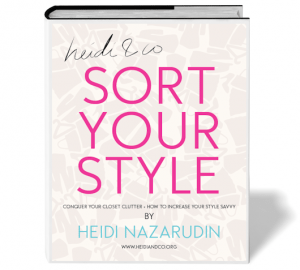 It’s titled “Sort Your Style: Conquer Your Closet Clutter + How to Increase Your Style Savvy” and it’s yours when you sign up for Heidi’s list. What I love about this e-book (and yes, I downloaded my copy and browsed through it last night) is how it helps you use what you already have in your own closet! That is probably the most popular question I get. Ladies love to purchase new things, but they want to know two things: how can I create different outfits with what I already have and what are the basic closet staples I should have. This e-book covers both. Heidi also educates you on how to dress to best flatter your figure. Not your friend’s figure or your neighbor’s figure or that girl in the magazine’s figure. Yours. Heidi’s book helps you to avoid impulse buys and provides you with the do’s and don’ts of buying new items. She also gives you questions to ask yourself before purchasing and more very useful advice. She even goes into what kinds of hangers to purchase, the ins and outs of jewelry organization and just making your closet work for you. “Most importantly, it’s about understanding your personal style. When you understand your own style, you’ve figured out the looks that you love and are comfortable with. It means that you’ve found the silhouettes that enhance your figure. Once you find this, you’ll never go wrong with your fashion picks ever again. This is your style. This is you. So be bold and express yourself,” states Nazarudin. So, what are you waiting for?! Go grab your copy. It’s the perfect weekend read. You’ll even have some time (and motivation) to get that closet in shape before Monday hits. I know it’s on my weekend to-do list!